Bookkeepers and accountants—many people associate these two roles as being one in the same. While they share common goals, bookkeepers support businesses differently than accountants, and at different stages in your business’ financial cycle. Joseph Falco Accounting Services, Inc. is a team of accounting professionals that offer financial support in different ways. 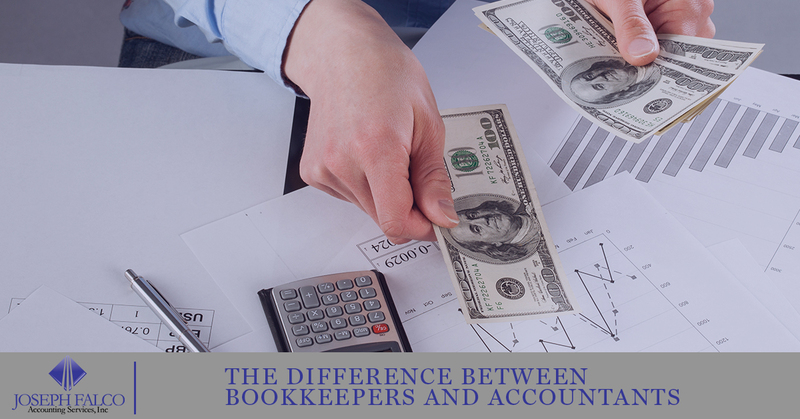 In this article, we’ll break down the difference between these two important functions so you have a better understanding of how a bookkeeper and an accountant can help your business. There are several components bookkeepers manage, but the most important is maintaining general ledgers. General ledgers are basic documents that keep track of sale’s amounts and expense receipts. Bookkeepers will manage general ledgers by working with a specialized software or a computerized spreadsheet, and the more sales that are completed, the more often the ledger is posted. A bookkeeper’s role can be complex and very involved, or the complete opposite. It all depends on the size of the business and the amount of transactions that are made. Your bookkeeper will keep track of every sale and purchase made by your business, record the activity on the general ledger, and provide supporting documentation that the IRS requires to ensure that you and your business are protected. An accountant’s role tends to be a little more involved than a bookkeeper but equally important to your business model. Accountants use financial information compiled by the bookkeeper (or business owner) and build financial models based off of that information. Essentially, an accountant provides reports and data to the business owner which bring all of the key financial components together, resulting in a deeper understanding of profitability and cash flow awareness. The information that is gathered from general ledgers that the bookkeeper has prepared is turned into statements and reveals a larger picture of the business. Business owners will seek guidance from an accountant to strategize tax planning and filing, as well as financial forecasting. As you’ve read, bookkeepers and accountants have vastly similar roles but also considerably different responsibilities that impact businesses in different ways. A bookkeeper typically only needs between two and four years of experience, or at least an associate’s degree to be able to handle bookkeeping work. While the title of an accountant requires at least a bachelor’s degree specifically in accounting or finance degrees. Accountants are eligible for professional certifications and designations, unlike bookkeepers. One of the most common titles accountants will pursue is a CPA (Certified Public Accountant). In order to obtain this designation, accountants must pass the Uniform Certified Public Accountant exam and currently hold the title of a professional accountant. To ensure long-term success of every business, large or small, many business owners will seek the expertise of a qualified bookkeeper, and a professional accountant. Some business owners may choose to manage their finances on their own, which is a financial decision that only business owners can decide. While other owners turn to bookkeepers and accountants to track, record, monitor, and actively establish a financial model that a business follows to result in business growth. Whether you’re looking for a bookkeeper for a small business to assist in all of your company’s transactions, or you need an accountant to direct you and your business toward financial strength and you’re in Brooklyn, Joseph Falco Accounting Services, Inc. can help. We offer a full-range of accounting services to manage your business and help your business grow. Contact Joseph Falco Accounting Services in Brooklyn today for a free consultation.